We’ve tried raw, Honest Kitchen (used to like it, but not any more), canned Merrick puppy, canned Evo puppy, Iams biscuits, Mother Hubbard biscuits, poached chicken breast (she spits it on the floor), diced sirloin and sausage. She ate none of it. She simply has no interest in food. It seems to be something about the smell – and, since the muffins have a very bland smell, she doesn’t mind those. I’m going to try some cottage cheese this afternoon, with fingers crossed. With two weeks to go until she’s due, it’s a bad time for her to refuse to eat. Gah. Dog breeding — so much fun! Fun as in ‘hey, watch me hit myself in the head with this hammer!’. 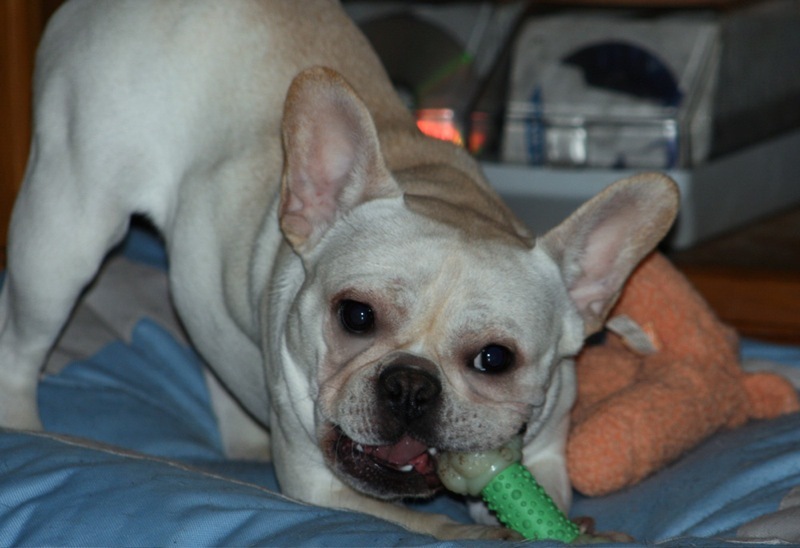 Our friend Stephanie over at Stephlyn French Bulldogs has two cute Frenchies looking for new homes. First up is Fanny, who I happen to have a particular soft spot for. Fanny lived here with us for six months, and is possibly the happiest French Bulldog I’ve ever met. That’s her in the “Tessa Earns a Nap” video, bouncing around and generally being a total goofball. She’s just under two years, cream and as cute as can be. She’s great with cats, other dogs who won’t be mean to her, and kids (although so far, she’s only met older kids). She has a problem with really steep stairs, so she’d be best in a home with few or none. She’s in Maryland, but if you arrange it fairly soon, she could be picked up in the Toronto area. Second up is Spice, and adorable little brindle puppy. She’s got lots of attitude, and is very sweet. As with Fanny, she’s in Maryland, but could be picked up in Toronto if arrangements are made in time. Both Spice and Fanny are available to pet homes on mandatory spay contracts. Here’s a video of Fanny playing with Tessa and the other dogs. Seriously, how cute is this girl? A friend of mine swears by their food. I can’t justify it for the 50 pound garbage disposal (that would be the fluffy one) although I suspect Mr. Picky (that would be the unfluffy one) might actually like these. Cait’s last blog post..Why do dogs chew?